ArcGIS is much more than technology for GIS experts. People working outside the GIS department can use ArcGIS. ArcGIS interconnects spatial information throughout the enterprise. 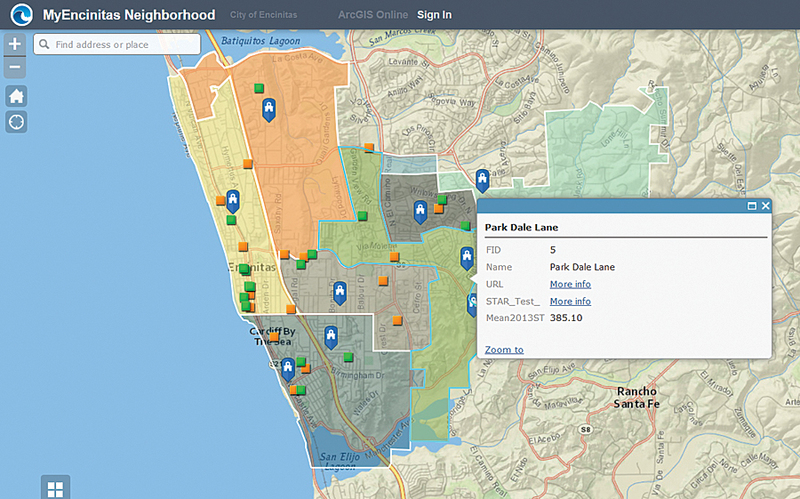 Web AppBuilder for ArcGIS makes it easy to configure responsive apps without writing any code. People today expect to access the information they need, collaborate with others, and produce results at any time, on any device, from wherever they are. The line between the work people do inside and outside their offices is blurring; analysis and decision making are taking place whenever and wherever they need to occur. In anticipation of these growing trends, Esri has evolved ArcGIS into a location platform that gives people in any organization the ability to discover, use, make, and share maps from any device, anywhere, at any time. ArcGIS is more than technology for GIS experts. It is a location platform for empowering the entire enterprise—from line-of-business managers to the mobile work force to top-level executives—with timely, accurate information and a means of collaboration. ArcGIS channels location data stored in multiple systems across the organization into one system for mapping and spatial analysis. This means that people working outside the GIS department can use ArcGIS to pull together information from many authoritative sources to gain new insights. They can use maps and spatial analysis to illustrate how circumstances have changed over time and spot important trends that impact their business, customers, and assets. Today, ArcGIS is used by organizations in every industry to perform activities that include managing asset and resource information, planning and analysis, getting information into and out of the field, providing a comprehensive view of operations, empowering stakeholders with accurate and timely spatial information, and geoenabling other business systems. Servers—Web GIS is powered by GIS services. Servers transform your data into web services. ArcGIS includes GIS servers that you can use in your own infrastructure (ArcGIS for Server), as well as servers that we host on your behalf (ArcGIS Online). These servers can connect to data (file, image), tables in a database, a complete geodatabase model, or even real-time data. The point of server technology is to web enable your data and GIS tools so that people can get to the information they need using browsers and devices. Collector for ArcGIS lets you interact with your organization's maps and data no matter where you are. Portals—This is how you manage the geographic knowledge that people in an organization create and use. Essentially, a portal is a geocentric content management system. It sits on top of your server technology and lets you mash up various web services to create a map. You can use a portal to combine your own data with Esri data and Esri Partner data and create a map. Your map can then be used with every Esri app, as well as apps created with Esri’s software developer kits (SDK). Portals are also a way of controlling access to the ArcGIS platform. They provide access to the right people at the right time. Apps—Apps are the means by which people experience GIS and location analytics. They make the ArcGIS platform accessible to a broad spectrum of users, regardless of whether they are GIS professionals or knowledge workers who are unfamiliar with GIS. At one end of the spectrum, GIS professionals can use ArcGIS for Desktop and its applications (including ArcMap and the new ArcGIS Pro), as well as ArcGIS solutions that align with specific business needs, to author maps, models, and tools. At the other end of the spectrum, knowledge workers, executives, and the public—people who know little or nothing about GIS—can access apps on their local machines, smartphones, or tablets to easily see the information they need on a map and make decisions based on the most current data. The apps that are part of the ArcGIS platform are built by Esri, its distributors, and its partners. In general, Esri builds foundational apps that cut across industries, including Operations Dashboard for ArcGIS, Collector for ArcGIS, and Explorer for ArcGIS. Esri also provides apps that integrate with leading business systems, such as Microsoft Office, IBM Cognos, MicroStrategy, SAP, and Salesforce. Distributors and partners use the ArcGIS platform to build focused apps for specific industries and workflows. Many of the apps created by Esri, its distributors, and its partners are available on ArcGIS Marketplace. 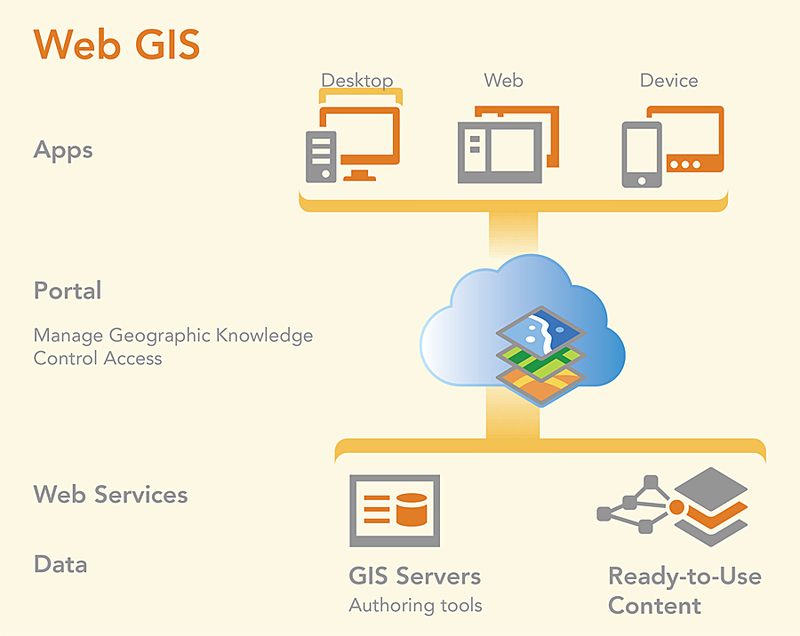 Web GIS, a key aspect of the ArcGIS platform, includes apps, a portal, web services, and data. Software as a Service (SaaS)—Your portal, your GIS servers, and content all come from ArcGIS Online. Software—Your portal is Portal for ArcGIS, your GIS server is ArcGIS for Server, and your content comes from Data Appliance for ArcGIS. Hybrid—Your portal, servers, and content come from a combination of SaaS and software. ArcGIS includes a variety of tools that developers can use to embed intelligence about location into other apps. They can build apps using a combination of ArcGIS Runtime SDKs and ArcGIS for Developers—a special ArcGIS Online account that has a pricing model tailored to the way developers operate. Developers can also continue to use the Esri Developer Network to develop and test on ArcGIS Engine, ArcGIS for Server, and ArcGIS for Desktop. ArcGIS Pro handles everything from fast sketching to image processing to visualizing your world in 3D. Today, every employee or contractor in an organization has their own identity. That identity is important to the organization and to the individual. Identity is usually tied to roles in the organization and, with respect to computer technology, it is also tied to what a person can do, see, and edit. Named user licensing allows organizations to administrate their ArcGIS environment simply. It allows administrators to easily define who has access to data, maps, and apps. Identity is a cornerstone in nearly every collaborative endeavor. People want to know who they are collaborating with. Identity (via named users) provides this. It is also the key to organizing and sharing information. Currently, ArcGIS Online is supported with a named user licensing model. Later this year, ArcGIS for Desktop will also be supported with this model. ArcGIS provides a common location platform to support geocentric, geoenabled, and geoembedded workflows. It is open, configurable, fast, and efficient. It helps organizations integrate, display, analyze, and enrich information from many sources; see important changes that impact business; and bring new insights for better decision making. A key component of the ArcGIS platform is web GIS, which combines GIS servers, portals, and apps to enable everyone in an organization to discover, use, make, and share maps from any device, anywhere, anytime. Web GIS can be implemented as SaaS, as software on-premises, or as a hybrid of these. Finally, ArcGIS is a platform for developers. Developers can use ArcGIS APIs and SDKs to create a variety of apps for organizations, businesses, and consumers. 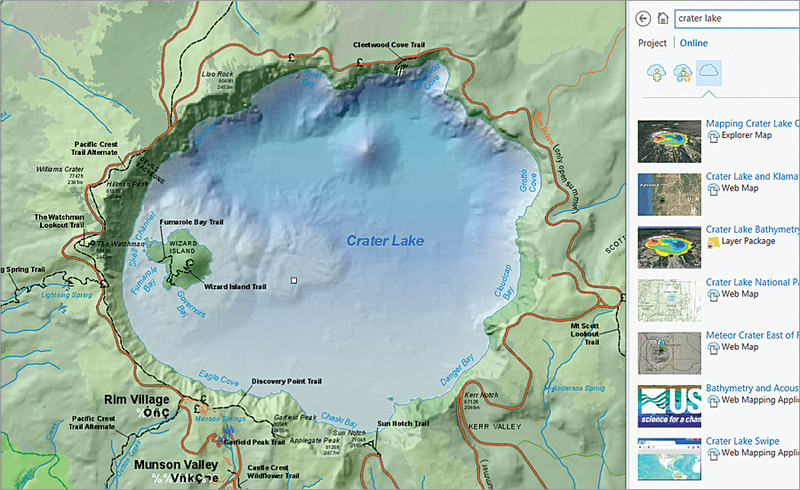 Learn more about what’s coming to the ArcGIS platform in 2014 by visiting esri.com/whatscoming.